Despite not being in America and not normally celebrating Thanksgiving, we decided to do so this year. I will be posting about our dinner tomorrow because this post is all about the pie! 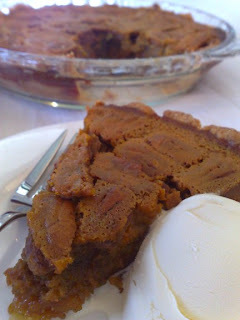 This week's Thanksgiving inspired recipe for Twofer Pie was chosen by Vibi of La Casserole Carree. Pumpkin Pie and Pecan Pie aren't very common in Australia so I always order them whenever I see them on a menu. As with everything else it seems there are delicious versions and horrible pallid stodgy versions. So I was very curious to see what a blend of the 2 would be like! This is only the second time I have used Dorie's pastry. The last time was for my peach and raspberry galette. We really enjoyed it at the time but I was disappointed with the lack of flakiness. Deb of SmittenKitchen very conveniently posted lots of pastry tips this week and while I tried to incorporate some of her techniques I still ended up with a very shrunk pastry shell! So frustrating! I initially thought there would be far too much filling but it only spilled over the crust in a few spots, and they were the spots where the crust had shrunk considerably. 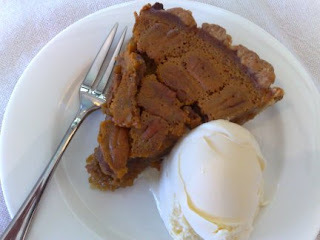 I made a few changes to the recipe, using fresh steamed pumpkin as canned is not available here, replacing the corn syrup with golden syrup and using cream instead of melted butter in the pecan filling because I was too lazy to melt any butter! I know all of these things could have affected the cooking/setting time so I wasn't worried about that at all. It did take far longer to cook than suggested - 1 hr 25 minutes all up - but it definitely needed it and I didn't have any problems with the crust getting too brown like some others did. Wow. This was really tasty. The texture was a lot lighter than I expected and it smelt divine. My piece was just warm in the middle which made the icecream start to melt. Yum! I'm really hoping this freezes ok (I know custards can be a problem). There's no way we can (or should!) eat this between just the 3 of us! Thank you very, very much for participating with me this week, especially from Australia, where apparently canned pumpkin puree and pecans are not the easiest things to find in grocery stores! I'm so glad you liked it, I'm sure it was as good as it looks! Looks wonderful! And now that you have the filling recipe, there's plenty of time to perfect the crust :) Maybe if you didn't pre-bake the crust? Agree - the pie was delicious. Nice job.